Keith Allen, the first head coach of the Flyers who became the general manager that built the organization’s Stanley Cup championship teams of 1974 and 1975, passed away Tuesday. He was 90. "Keith was the first coach in the history of the Philadelphia Flyers and a man for whom I have tremendous respect," said Philadelphia Flyers Chairman Ed Snider. "In my mind, he was and always will be one of the greatest General Managers in the history of hockey. He was known as 'Keith the Thief,' I never knew of a bad deal he made. This team would never have reached the level of success we have had over the past 48 years if it were not for Keith. "Over the years he became one of my closest confidants and one of my best friends. I will never forget all of the many memories we shared together." added Snider. "I would like to extend my condolences to Keith's family, his wife Joyce, their sons, Brad and Blake, and their daughter, Traci, and their four grandchildren, Chelsea, Shay, Jillian, and Chase. He will sorely be missed by all of us." Allen joined the Flyers in 1966, one year prior to the franchise’s opening season. He led the club behind the bench at its inception in 1967 and won the West Division title that season. He coached the team through the 1969-70 season. 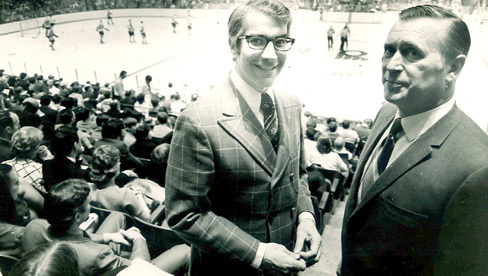 On December 22, 1969, Allen became the general manager of the Flyers and held that position until May 27, 1983. During his tenure as GM, the Flyers won two Stanley Cups (1973-74 and 1974-75), reached the Stanley Cup Final four times, and compiled a 563-322-194 record for a .612 winning percentage. Allen built the two Stanley Cup teams through the acquisition of such players as Barry Ashbee, Rick MacLeish, Bill Flett, Ross Lonsberry, Andre Dupont, Reggie Leach, and the reacquisition of Bernie Parent through trades. He was also responsible for drafting Bill Clement, Bob Kelly, Bill Barber, Tom Bladon, Jimmy Watson, Paul Holmgren, Pete Peeters, Dave Brown, Ron Sutter, and Ron Hextall. Some of his other draft choices include Brian Propp, Ken Linseman, and Pelle Lindbergh. Also, he signed former Flyers Tim Kerr, Orest Kindrachuk, Bob Froese, and Dave Poulin as free agents and acquired Mark Howe via trade. "Keith was responsible for the Flyers winning the Stanley Cup," said Bob Clarke. "He was in charge of the draft, in charge of the trades, in charge of getting Bernie [Parent] back – all the things necessary for us to win the SC. He put the pieces in place and hired the coach. He, more than anybody was responsible for us winning the Cups." On September 21, 1992, Allen was inducted into the Hockey Hall of Fame, joining Ed Snider in the Builders category. He was inducted into the Flyers Hall of Fame in March 1989. Allen was also a recipient of the Lester Patrick Trophy in 1988 for outstanding service to hockey in the United States, was named The Hockey News’ NHL Executive of the Year in 1979-80 and was the first recipient of The Hockey News’ Minor League Executive of the Year Award in 1959-60 while with the Seattle Totems of the WHL. Prior to joining the Flyers in 1966, Allen spent ten years as coach/GM/bookkeeper/publicist for the Totems, leading them to the WHL title in 1958-59. "Keith was one of those men who you very rarely come across who was fatherly and grandfatherly to all of us players and our families and yet was tough enough and strong enough to do the things that were necessary for us to win the Stanley Cup," Clarke said. "Every player who ever played here under his leadership liked Keith. Anyone was traded liked Keith. He may have been the only man in hockey who everybody liked. He didn’t have a person who disliked him in the world. "He was a wonderful, wonderful man and one of the best general managers of all time." Allen spent 13 years as a pro hockey player, including parts of two seasons with the Detroit Red Wings. He was a member of the Wings’ 1953-54 Stanley Cup championship team. Allen is survived by his wife Joyce, his three children – sons Brad and Blake and daughter Traci – and four grandchildren, Chelsea, Shay, Jillian, and Chase.